2016 was a bit of a mixed bag for superhero movies, but for the most part, Warner Bros. still has some work to do with the DC Extended Universe. Sure, many fans did like Batman V Superman: Dawn of Justice and Suicide Squad, but the movies were panned by critics and divisive among the moviegoing public. So next year, Wonder Woman is going to have to shoulder the responsibility of correcting the course. Warner Bros. has released a new photo and it is still hard to know what the end result will be, but this new photo is very encouraging. 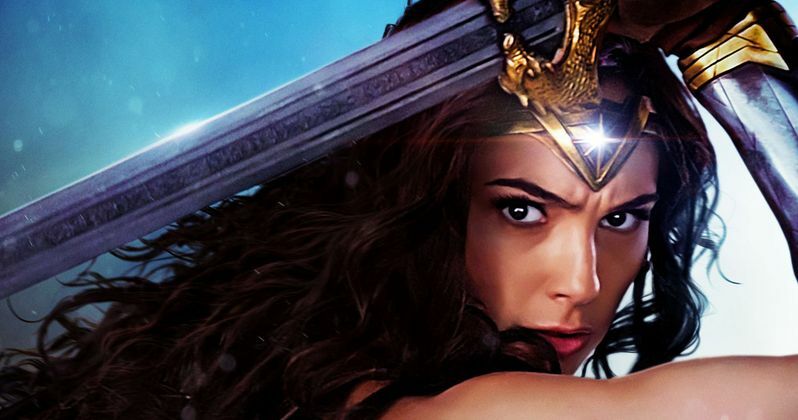 The still comes courtesy of Entertainment Weekly and shows Gal Gadot as the title hero stealing what is referred to as the "god killer" sword. This is said to be the moment in Wonder Woman movie when Diana Prince decides to forge her own path and step out on her own. Here is what Director Patty Jenkins had to say about it. "This is her moment. She's heard all the terrible things about man's land. But she's also heard that mankind is in need and under duress. This is her great moment to make the decision to be the one to try and save them." In Wonder Woman, this "god killer" sword is held in the heavily guarded armory on the all-female island of Themyscira. Diana Prince decides to disobey her mother and help Steve Trevor (Chris Pine), so she breaks into the vault to steal the sword. It looks like a pretty epic moment based on the shot, but anyone who saw Batman V Superman: Dawn of Justice already saw this sword in action. This is the same sword that she used to fight Doomsday, which did some serious damage to him. So "god killer" seems like an appropriate name. Outside of having to shoulder the responsibility of correcting the course for future DC Comics movies, Wonder Woman will also have the responsibility of proving that a female-led superhero movie can work in the modern age. Ever since the superhero movie craze started back in the early 2000's, fans have been calling for a female-led superhero movie. Save for Elektra (which most of us would like to try and forget about), that hasn't really happened yet. Many were upset when Marvel Studios announced their Phase 3 lineup, which failed to include a Scarlett Johansson/Black Widow Solo movie, which everyone assumed was going to happen. That left room for Warner Bros. to swoop in and get Wonder Woman done, allowing them to beat Marvel to the punch. It's just a matter of if they can deliver on the promise. The movie is being directed by Patty Jenkins and stars Gal Gadot, Chris Pine, Robin Wright, Connie Nielsen, David Thewlis, Elena Anaya, Danny Huston, Ewen Bremner and Lucy Davis. Wonder Woman is set to hit theaters on June 23, 2017. Be sure to check out the new image from the movie for yourself below.